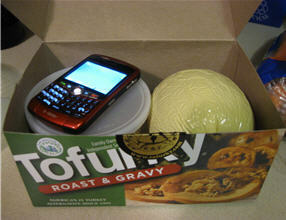 From the size of the box, you’d think a Tofurky would be fairly large. I saved the box to use to wrap my gift for this year's White Elephant Gift Exchange Party. Not really. A Tofurky is size of a grapefruit. It comes with a container of gravy that is about the same size as the Tofurky itself. Baking the Tofurky was easier than a real turkey. 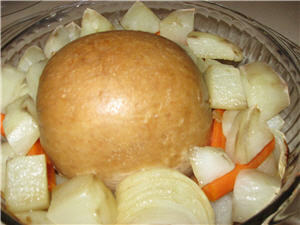 I surrounded it with pealed and cut potatoes, onions, and carrots and popped it into the oven for a few hours. Blitzkrieg supervised all Tofurky preparations. I’ll eat that if you won’t! The Tofurky browned nicely in the oven. 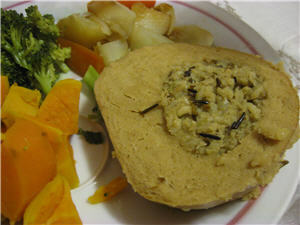 I served the Tofurky with sweet potatoes, steamed broccoli, and corn and molasses bread. I have to admit the most fun thing about the Tofurky experience was live tweeting our Tofurky preparations. More than one of my Twitter followers suggested that eating the box might be more appetizing eating the actual Tofurky. 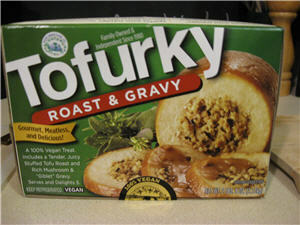 It was difficult to believe that the Tofurky and gravy weren’t made with real meat because it sure tasted like turkey. The Tofurky tasted like turkey roll. Tofurky didn’t have that tangy soy endnote that is often found in soy meat flavored lunchmeats. A Tofurky won’t exactly replace the taste of a real turkey. However the it tasted was good and I would eat it again. I'll have to take your word for it, can't go there. okay I found this SO interesting. I've got loads of vegan friends so i always like to hear what meat eaters think of vegan stuff since I think that people who have gone without for a while totally forget what things tastes like. how was the texture? I've actually never eaten the Tofurky in a box but I have made my own. I have no idea where that recipe ended up though. It was actually very good. Everyone else (aka, the meat eaters) was surprised by how good it tasted too. I have always wanted to try a Tofurkey but may family has always naysayed it. Thank you for the review - I was worried it would be too soybeanish but it sounds like if I prepare it the same way I have turkey in the past, the difference might not be noticed. It will just be me and my son this year - despite he protests I may sneak it in to see if he notices the difference. Interesting!! I had a tofurky hot dog thing once and I didn't like very much (maybe because I love juicy all beef hot dogs...) it but I might be willing to try one in turkey form! I've never had tofurkey before but it certainly sounds interesting. Glad to hear it really does taste like turkey. Marissa - The texture and taste was the same as a turkey roll.The wild rice stuffing was great! I'm a big lover of wild rice. 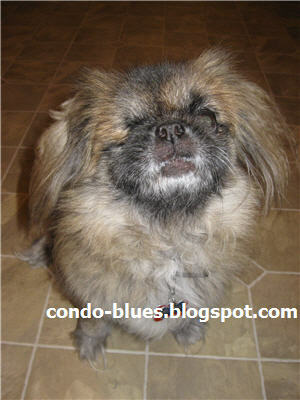 Amie - I had an early version of a tofu dog and it was pretty bad - it was all tofu and no flavoring. This stuff tastes like turkey meat, so I might give another brand of tofu hot dog a whirl someday. First Rob, now you. What is this world coming to? You guys are half convincing me to give Tofurky another try. The Tofurky tofurky, that is. We've had other Tofurky products, but none were well received by the fam. I didn't even like them. That was way back at the beginning of our meat reduction journey. Perhaps it was too naive to think we could go straight from steak and bacon to tofu. Probably. Now that we're a little more seasoned at this no meat thing, our view might be different. BTW, Blitzkrieg is hilarious! I want to squeeze his furry little cheeks. Thanks for sharing your Tofurky adventures on Midnight Maniac Meatless Mondays. 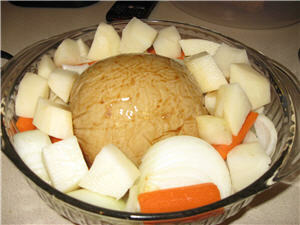 This is such an interesting post, I enjoyed reading how your tofurky came out! I've only had tofu once and didn't care for it but am willing to give it another try. Thank you so much for linking up to Cookbook Sundays. My apologies for taking so long to get back to you. I hope you're having a great week! Thanks for joining in on the carnival! I didn't think it tasted like real turkey, but more like the processed turkey. It was edible and I'd eat it again. I think the Ellen Show had a chef come on the show and show people how to make their own tofurky.